The state budget revenues amounted to 7.7 billion manats ($4.5 billion) in the first half of 2017, which is up by 25.9 percent as compared to the same period of 2016. 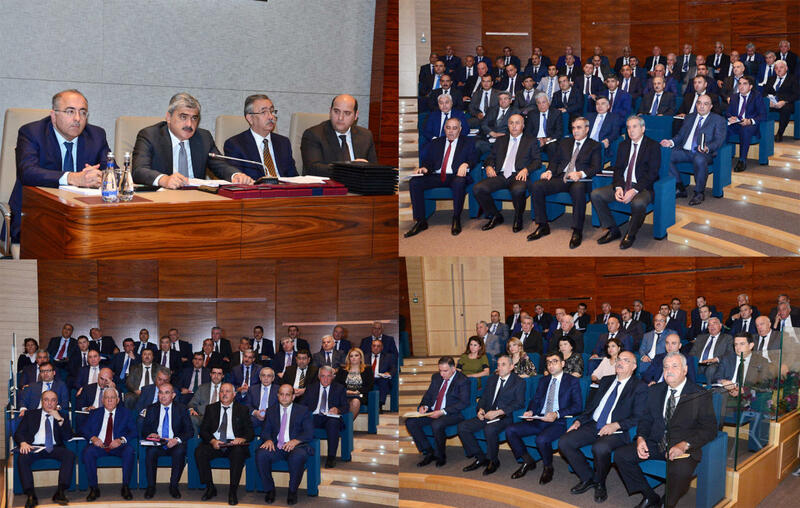 Azerbaijani Finance Minister Samir Sharifov made the remarks during an expanded meeting of the board of the Ministry on July 19. He went on to say that the expenses of the state budget increased by 20.1 percent to 8.2 billion manats ($4.8 billion) in this period, as percent, as compared to the same period of the previous year. It means the fulfillment of the forecast by 100.2 percent. The expenses of the consolidated budget for January to June amounted to 11.5 billion manats ($6.76 billion), which means an increase by 25.9 percent, as compared to the same period of 2016. The incomes of the consolidated budget for the six months of the year were 11.6 billion manats ($6.8 billion), more by 25.3 percent, as compared to the same period of last year. The minister stressed that the increase in the share of non-oil revenues in Azerbaijan's GDP and state budget revenues, and the increase in the tax revenue collection ratio are among the priorities for securing the revenue side of the state budget for 2018. In addition, the objectives are to strengthen measures to eliminate tax debts and eliminate cases of tax evasion, continue work on balancing urban and regional local incomes and expenditures. Deputy Finance Minister Emin Huseynov addressing the meeting said that, in accordance with the tasks set for the Ministry of Finance, and taking into account international experience and features of the national economy, draft regulations were prepared in connection with the application of budget rules and a document on medium- and long-term strategy for public debt management, and Proposals on the medium-term expenditure framework and the formation of the effective budget mechanism. The state budget revenues for 2017 are forecast at the level of 16.766 billion manats ($9.85 billion), and expenses at 17.941 billion manats ($10.5 billion). 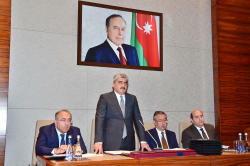 The deficit of the state budget is expected to be in the amount of 1.175 billion manats ($690.5 million), which is 1.8 percent of the expected GDP of Azerbaijan in 2017. The Azerbaijani Parliament [Milli Majlis] approved the amendments to the Law on State Budget of 2017 on June 30. Revenues in the revised state budget are forecast at 16.8 billion manats ($9.9 million), which is 511 million manats ($300.3 million) or 3.1 percent more than the initially approved forecast. Expenditures are expected to stand at 17.9 billion manats ($10.5 billion), 1.04 billion manats ($611 million) or 6.2 percent more than the initial forecast. Deficit of the state budget is forecast to stand at 1.2 billion manats ($705 million) [an increase by 530 million manats ($311.4 million)], which is 1.8 percent of expected GDP of Azerbaijan in 2017. Under the changes, about 135 million manats ($79.3 million) will be added to the state budget through the Ministry of Taxes. Moreover, 76 million manats ($44.6 million) are planned to be attracted through off-budget revenues. It is also planned to attract additional funds through the State Customs Committee (2.205 billion manats-$1.3 billion). The profit of the Central Bank of Azerbaijan (CBA) will also be included in the state budget.